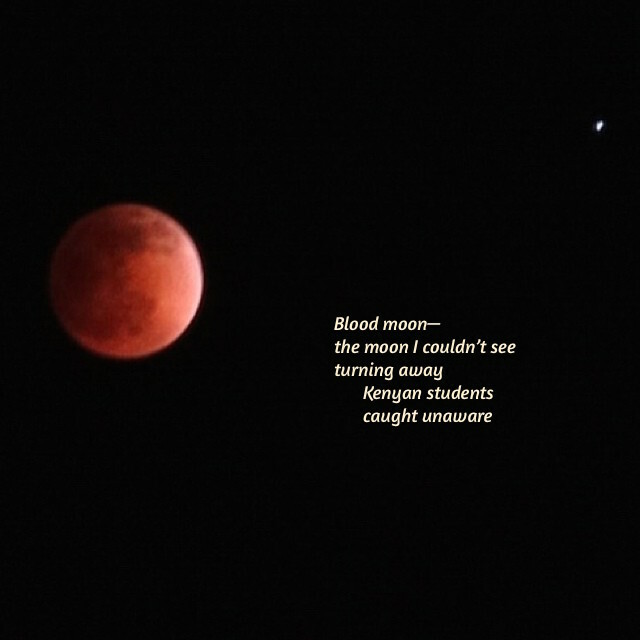 This entry was posted in death, poetry, tanka, Tanka Art poem, tragedy and tagged blood moon, darkness, Garissa Kenya, Mary Kendall poetry, mourning, murder, sacrifice, sadness, tragedy, world peace plea, world unrest. Bookmark the permalink. Thank you for this tribute to the Kenyan students, Mary. Not only is it a disturbing and violent loss of life, but a loss for Kenya as well. It is so challenging to go to school in Kenya, only the most devoted youth make it to school…these were future leaders. Acts like these are so tragic for all of us. My heart breaks for all the youth and all who loved them. Thank you for your wonderful comment. I know it isn’t easy.